Loch Duich at low tide, Scotland. Eilean Donan Castle - view of castle located in Loch Duich at low tide on a... - 20 Inch Canvas Print (51cm) by Ardea . as faithful retainers to the Seaforths. 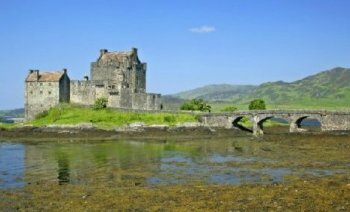 A MacRae was always the Constable of the castle of Eilean Donan. 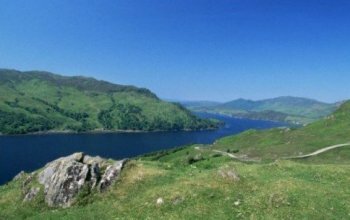 Raised in the 12th century the sturdy old walls of the castle guarded the area where Loch Alsh divides into Loch Duich and Loch Long and stands on its own rocky islet. It was joined to the land by a strongly guarded causeway, and at each high tide the castle was cut off by water. It was considered to be impregnable. of an English warship squadron whose broadsides rapidly reduced the old fortress to ruins. The old castle remained a ruin until almost two centuries later when it was restored by Colonel John MacRae-Gilstrap, one of whose ancestors had been appointed Constable in the 17th century. despite warnings from St. Columba as to his probable fate, and was murdered by Norsemen as a result. Loch Duich - 10x8 Print (25x20cm) by Robert Harding . which includes the Five Sisters of Kintail and Bein Fhada (3,383 feet). The area comprises some of the finest scenery in the Western Highlands.